A good DVD player - but that's it! When the first DVD players were introduced, they were hailed as universal players, which would be able to satisfy all our silver disc requirements, even in two sizes (12 and 8 cm). They started out as "Digital Video Disc" players, but were soon promoted to "Digital Versatile Disc" players. In short, the promise was that beside pictures, we would be able to use these units for our audio requirements as well, thus eliminating the need for several dedicated players. Now we are three generations down the road, the fourth generation of DVD players is on the market, so it is about time we took a look at how much or little of the universal character has materialized so far. And Marantz, a wholly owned subsidiary of mighty Philips, which evokes memories of a world-class audio manufacturer of yesteryear, seemed like a good place to start. I purposely selected the smallest and cheapest of a line of three models offered - if they can do it here, they're home and dry. Model DVD 4000 follows Marantz's "End of Millenium" soft line styling. The fascia is plain and is made of plastic which simulates brushed aluminium. It has a narrow disc tray, profiled from the front, and rounded, rubber switches for basic functions. All these functions are duplicated on the remote control, except one - the display dimmer is present only on the fascia. It has four modes - full on, reduced 1, reduced 2 and off. To my mind, its looks are hardly innovative, but are rather restrained and good looking and will easily blend into many an environment. The only garish thing about it are the two high luminance green LEDs, which you can see across the street, let alone room. In return, the main display uses blue matrix LEDs and looks very good in all modes - very legible, yet unpretentious. Good going there. Inside, the construction is somewhat special. Most DVD units have drive servos and associated electronics mounted on a board right underneath the drive itself, good practice as it shortens connections. Marantz follows this practice, but adds a typically Philips touch by installing the video board beneath the drive control board. Upon closer examination, I noticed that there was sheet metal between the two boards; since two more sides are also around the drive metal supports, this practically encloses the video board in a Faraday cage with the exception of the back side. Now, that's a good one - I wish more people did that. The power supply is a switching unit. Briefly, this multiplies our 50 or 60 Hz line frequency so that it is pushed above 20 kHz; then they need much smaller capacitors to effectively filter it out, and true enough, one 120uF/400V capacitor does most of this work. This type of power supply enables manufacturers to produce only one model for voltages from 110V to 240V, 50 or 60 Hz, they are compact and relatively cheap to manufacture. However, they also tend to be noisy, a problem which can be solved, but at a cost, which rather offsets the primary objective of being cheap. To be fair to Marantz, the signal-to-noise ratio of this model is very good, better than with cheaper audio CD players. Marantz quotes a figure of -100dB (EIAJ) and I would venture a guess that this is indeed so or thereabout, using the standard home test of cranking up the amp volume to the maximum and placing one's ear against the tweeter. Just don't forget to turn the volume down right after that, or you're in for a nasty surprise and possibly some burned out loudspeakers, or amps, or both. 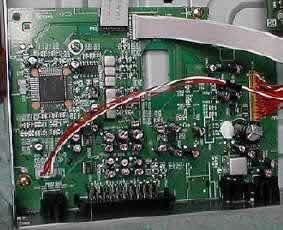 The audio board shares a printed circuit board with other outputs. Basically, it uses an NJR 4580 dual op amp for its audio output - just the same as many cheap audio CD players, including Marantz's own models 4000 and 5000. Nothing to write home about. Audio outputs, however, do not exist on the back as such. The two RCA Cinch connectors, one above the other, serve other purposes (bus in and out). Audio signal is taken off the SCART connector. Don't worry, you won't have to go out shopping for adapter cables yet, since Marantz provides an adapter cable, with SCART on one side, the one going into the player, and three RCA Cinch jacks on the other side, one for composite video, and two for stereo audio out. And just when you think you have it made, disaster strikes - you notice the idiot length of these adapters. They are just long enough to plug into an amp or preamp if you place the DVD right on top of it - any further than that, and you need additional cabling. Even if you manage to put the DVD player on top of an amp, you will still need additional cabling for taking the video signal to your TV set. So, you are faced with a simple dilemma - just throw away what you received with the unit and buy a good adapter, with decent quality cable and length, or use adapters there and then. This is, I feel, an unacceptable price compromise Marantz has made regarding CD playback - surely the addition of two simple RCA Cinch receptacles for audio out wouldn't make this model uncompetitive pricewise! Since this is a DVD player, it would be silly not to say that its picture quality is in the very good class - no edge distortion, no color spillover, no pincushion effects, nothing but the program. Putting on an audio CD and playing it at just above whisper level produced a sound much like what you would hear from an audio CD player on or near the bottom of the price scale, costing $/Euro 150-180, and assuming brand name products. This is to say the sound was a little shut in, as if the performers were performing in a small and acoustically not too good a room. Detail was there, but not particularly well rendered. Ambience was on the low side, below what I would expect from a solid economy class unit. However, oddly enough, the bass lines were deeper and slightly cleaner than is usual in the economy class. This could be a matter of design, given that DVD has plenty of effects on the bass, but it could also be a matter of the power supply design, or a combination of both. However it was, it remains a fact that bass lines from this unit have more weight and authority than most CD players in the economy class, and I daresay some in the middle class. Fortunately, the treble range, while hardly exceptional or outstanding in any manner, was mercifully free of typical digital harshness. It didn't sound very good, but neither did it sound as bad as quite a few cheap CD players still sound today. Cranking up the volume brought out the above sonic character into greater prominence, but effectively changed nothing but the volume. Music still sound as it usually sounds in the economy class, yet the quality of the bass lines and absence of digital harshness in the treble did help to create an effect of a better quality economy CD player. Lack of ambience was merely emphasized when playing loud - while it wasn't bothersome, it also left out much of music vibrancy and being-there quality. The shut in room was perhaps a little larger now, but it was still a shut in room. This model sounds like a cheap CD player. In that sense, as audiophiles, we just have to keep on searching, or wait for technology to improve these players. I remind one and all that this is Marantz's entry level model - the model above this one, designated 6000, has more elaborate insides, includes a separate audio power supply, has a metal fascia and weighs almost twice as much as this one, at around 50% additional cost. The 4000 will play music, but will do so without much excitement or finesse. In conclusion, this model is obviously designed as a TV add-on and no more. As such, it has no audiophile pretensions, which is good, because while it will play music, the sound will be way below audiophile standards. If you already have a good CD player, then this unit is worth considering as a DVD-only machine; as such, at its price, it's one of the better units out there, with a good quality picture. So, above average for its price class picture, economy class sound - a fair compromise at the price. But for serious audio, look elsewhere.